Racing shoes might seem rather low on the totem pole of gear priorities, but when you consider that half your inputs are going to be made with your feet, the importance of having good shoes starts to become a little more obvious. Safety is the top priority for a racing shoe design of course, but beyond flame resistance and FIA/SFI certifications, racing shoes need to be durable, comfortable, grippy, light weight, and provide as much feedback as possible. To that end, if you want the pinnacle of current racing shoe design, the 2014 Alpinestars Tech 1-Z Formula 1 shoes should definitely be on your short list. 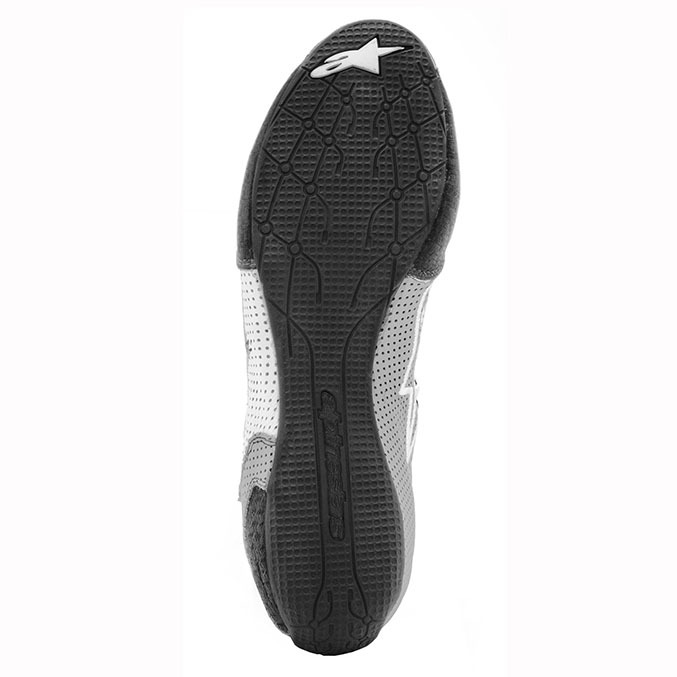 Designed and developed with input from Formula 1 racers, the Tech 1-Z shoe is made with top-shelf materials, including a supple and light weight kangaroo leather upper construction that quickly conforms to the shape of your foot and an ergonomic, molded fireproof polypropylene heel that provides support and stability inside the shoe. Additionally, the Tech 1-Z features Alpinestars’ exclusive thin rubber compound outsole, which provides your feet with unsurpassed levels of feel and grip. Beyond the high grade materials, the Tech 1-Z racing shoe utilizes smart design throughout. 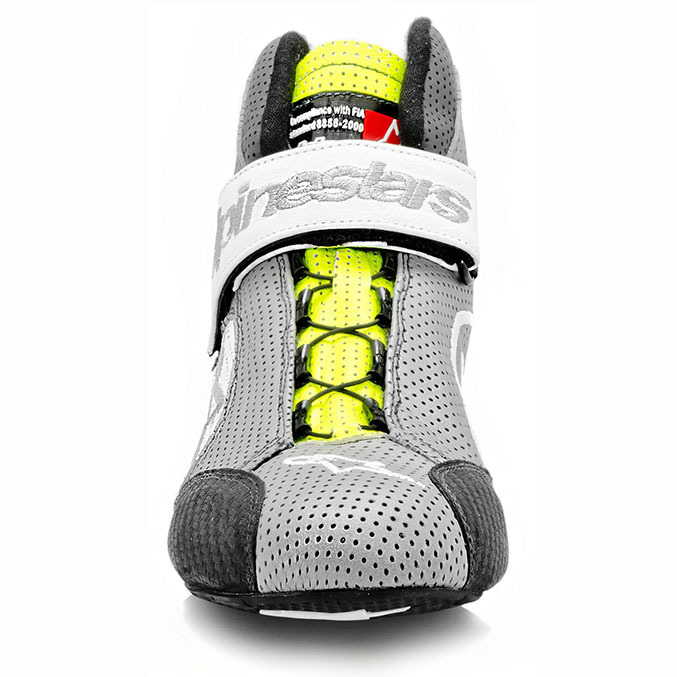 Features like the exclusive Kevlar speed lacing system, which is derived from Alpinestars MotoGP technology, make it easier to tighten and secure the lace while still wearing your racing gloves, while the single large Velcro ankle strap offers bolstered stability and the strategically placed perforated zones that provide exceptional ventilation. Simply put, the Tech 1-Z is a racing shoe without compromises. The Tech 1-Z racing shoe complies with the FIA 8856-2000 and SFI 3.3 homologation standards, and features a flame resistant Nomex lining along with lateral forefoot support for added stability and protection. Comfort is also an important aspect of racing shoe design, and the Tech 1-Z doesn’t disappoint with its roster of features here either: A thin tongue flap enhances comfort while providing a snug fit while lightweight, micro-porous padding around the heel and insole enhances comfort while driving and walking and an ergonomic foot bed ensures the foot maintains a natural, comfortable posture. All in, it amounts to one of the most well-designed and high quality racing shoes you can buy today. You can find the 2014 Alpinestars Tech 1-Z Formula 1 racing shoes (available in multiple colors) in the Winding Road Racing store. Click here to see all the racing shoes available from Winding Road Racing.